Kathleen Burkinshaw, "The Last Cherry Blossom"
Listen above to our conversation with Kathleen about her mother, her book, and the surviving Hiroshima trees, called Hibakujumoku. See the extended transcript below. Find out more about UNITAR's Green Legacy Hiroshima tree project and the ginkgo planted at UNCW with Kathleen and the Japanese Club. Note, the tree is erroneously tagged as being at UNC in Chapel Hill. About the author: Kathleen Burkinshaw is a Japanese American author residing in Charlotte, NC. She’s a wife, mom to a daughter in college, and owns a dog who is a kitchen ninja. Kathleen enjoyed a 10+ year career in HealthCare Management unfortunately cut short by the onset of Reflex Sympathetic Dystrophy (RSD). Writing gives her an outlet for her daily struggle with chronic pain. She has presented her mother’s experience in Hiroshima to middle and high schools for the past 8 years. She has carried her mother’s story in her heart and feels privileged to now share it with the world. Writing historical fiction also satisfies her obsessive love of researching anything and everything. The Last Cherry Blossom, is a SCBWI Crystal Kite Award Finalist (southeast region), 2016 Scholastic WNDB Reading Club selection, recently nominated for the NC Sir Walter Raleigh Fiction Award and the 2018 Sakura Medal in Japan. Gina: Tell me about your mom. Kathleen: She was a wonderful woman. She didn't carry a lot of anger with her as far as against the Americans because she did marry an American. She came to the states in 1959. She met my father, who was in the Air Force in Japan at the time. And she became a U.S. citizen within five years of coming to the States. And she also worked on the circuit boards that were on Apollo 11. So it was kind of interesting how she came from being in Japan, dealing with what she dealt with in the war and not having any ideas of trying to deal with the prejudices that she did have. She had prejudice in her own country after the bombing because they were considered- they called them "hibaksha,'' which basically meant “you are from the atomic weapons” and they didn't know how to treat the radiation or how that might work, what it could do if you married into their family and had children. And then when she came to the States in '59, there was still some prejudice against the Japanese at that time. And she really kept it close to the vest that she was from Hiroshima and that she lost her home and her family there. She didn't even tell me until I was about nine years old that she was actually from Hiroshima and not Tokyo in Japan. Gina: How do you think that it affected her the most in terms of going through the bombing? Kathleen: I think the immediate thing was how everything changed in an instant. 8:15 in the morning she was outside talking with a friend. And the interesting thing for this and how she looked at it was, she had two coincidences that happened that day that drastically changed how the turnout happened. The first one is that she was supposed to be with her classmates that day but she was sick over the weekend. So August 6th fell on a Monday and her Papa said to stay home, get some more rest and you'll join your classmates tomorrow. Well, the classmates were all in the center of town. They were taking down wooden buildings because of the immense fire bombings of Tokyo in March of '45. They didn't want to have that same kind of damage should a firebomb be used. So that put all of her classmates in the center of town that day. And her Papa owned a newspaper company there. He would work from home and then travel to the center of town to his office in the afternoon, but that day he was leaving very early in the morning because he had a journalist whose son was injured and he wanted to be able to visit him at one of the hospitals in Japan and her Papa was the only one that had the money and the means to be able to purchase that train ticket. So that put him in the center of town that morning. So at 8:15 she was standing out with her best friend and within minutes her home was gone, the life that she once knew was gone. She ended up losing her best friend. And trying to get used to the fact of losing her Papa and that she no longer could live in the same place that she lived. Her life just totally changed. And then as the months went by she started to lose other people in her family from the effects of radiation. Then as the years went by. It was very difficult for her to then try, at the age of 12- how do you push forward? How do you make friends again? She didn't even want to because she figured she'd just get used to her loneliness because it was safer. She was so afraid of giving love or friendship again and then having it all taken away in an instant. And I think that for her to deal with that, she was always very, very cautious. But you know, when she had me, and then with my daughter, her grandchild, she gave so much love. And to me that really showed she had a lot of integrity and she was determined to make a better life, to do things better, and to give a family love that she lost after the age of 12. She had had it up until then but then when everything fell apart that day- to have the courage to start all over, to move in with new family members that you had never met before. She went from Hiroshima to moving to Tokyo after the bombing and it was a whole different lifestyle for her. And it was very difficult. And then to make the leap to come to the United States and do something totally new showed a lot of strength and perseverance. Gina: Did she have a mother? Kathleen: She had a stepmother that she lived with. So it was her stepmother and her Papa. And she later lost her stepmother from radiation sickness within maybe a year. Gina: You just can't even imagine, you know? Kathleen: Exactly. Exactly. And I think what ended up happening to her is she had a house fall on top of her and her friend and that ended up killing her best friend. But the house falling on her really saved her from the initial blast of radiation of when the bomb first exploded. And I think that's what really saved her because we were very, very blessed. She was not ill until the last few months of her life and she was 82 when she passed away in 2015. So we were very, very lucky with that. And she did know the book was going to be published, that I was writing about her. So at least she could see that. She saw the publishing contract, she saw the draft of the book. So I was very, very glad that she would know that her story was going to be told and she was always surprised that people would be interested in knowing her story. I know she can look down now and see it, but she must be so amazed at what's been happening ever since the book came out. Gina: And that book you're talking about is The Last Cherry Blossom. Gina: Tell me about the book. Obviously your mother inspired the book- how much of it is parallel? 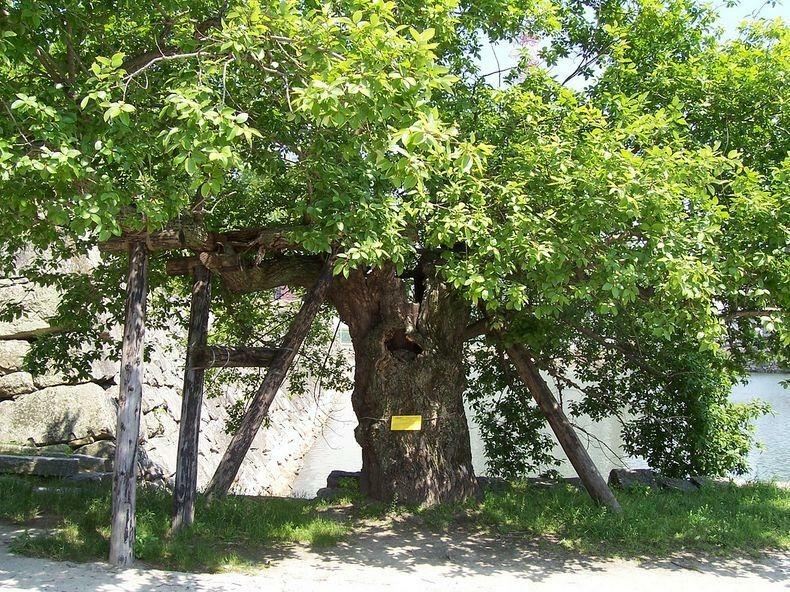 A tree that survived the atomic bombing of Hiroshima, called "Hibakujumoku"
Kathleen: Yes. When my daughter was in seventh grade, the thing that kind of started this whole journey with writing the book, she came home and she was very upset. And she said, “We're going to be ending our social studies section on World War II and as I was getting ready to leave the class I heard some kids talking about how they couldn't wait to see that really cool mushroom cloud picture. Do you think you could go talk about the people that were under that mushroom cloud, like grandma?” That's what really started it all. And that's where I had to ask my mom if she was OK if I did that, because I had never spoken publicly about it because, as I said, I only found out when I was nine and it was only because I was very persistent. She would have nightmares at the beginning of August. I noticed that the year before. And she would get very depressed and then the following year she had more nightmares and she would wake up screaming. She had those the rest of her life, but that's when she finally told me that she was from Hiroshima. So it took a while to even understand what she went through and I wasn't allowed to talk about it to anyone because she didn't want anything put upon her. So it was kind of interesting how it started with all the generations with my daughter asking to know more about it and my mother was willing for me to talk about it. Mainly it was because the students in my daughter’s class would all be around the age that my mom was -about 12. She figured they could probably relate to her story better. And they're all going to be future voters so that they could walk away knowing that nuclear weapons should never be used again. I went out to talk about that and I was invited back the following year and other middle schools had heard of it and then they started asking, “Is there anything that we could use, like a book, for curriculum?” I decided to start looking at that and that's what I really wanted to do. I don't start with the atomic bombing. I really wanted to give the idea of what the culture, what the mindset was then. How the people, the citizens of Japan thought about war. It was very different than our take on the Allied side because they had the Emperor and because they thought of him as divine and following what he wanted. I really wanted to research more of that because what I really want the kids to come away with, in addition to the nuclear weapons and not using them again, is that the children in Japan like my mom, they loved their family, they loved their friends, they worried what could happen to them and they wished for peace. The very same things that the Allied children had. I wanted to really try to bring that out because you can even apply it to today. The enemies that you perceive as your enemies, they're not always so different from ourselves. I think it's so important today to have that message and to try to think of things about the actual people and that the citizens are very different from the leaders. So that's kind of how I wanted to go about doing the book. Not only researching what my mother went through, learning more about it, reading other survivor accounts so I could try to pull things together, but the way I did it would be so that they could learn what life was for this 12 year old girl and her family in Hiroshima. What they were going through with the last year of the war, what she saw her friends and neighbors go through, and finding out a family secret right before the bomb is dropped. Her world changes so quickly in so many different areas. How does she cope with it? I think a lot of her issues as a 12 year old- she was clumsy, she didn't always like homework- there are a lot of things that middle school students could really relate to and even readers who are older than middle school. I've have had high schoolers read it and others and you can kind of see that she was a normal child. She just lived in a different country that was going through a different time. That's what I really hope to bring with the book. When they read it they can further understand it a little bit more. I think that's a side of Japan that's a time and a culture that we don't know very much about. There's nothing there from a 12 year old perspective of what happened at that time. I was really hoping that maybe this could help make a difference. Gina: Tell me about the title. Kathleen: I chose The Last Cherry Blossom because- the first reason is that my mother's favorite festival time of year was the cherry blossom time and it was also the very last time that her entire family was together celebrating something before the bomb dropped that year. In addition to that, after the bomb was dropped, they had felt that nothing would ever grow again on their soil for five to ten years. And the cherry blossoms came back in bloom. Not all of them, but they did bloom again in that spring. I always felt that that showed the strength and the perseverance of the Japanese people. Of how they decided to pull together and try to bring some kind of normalcy back to their lives after the war. Not that they were happy how it ended, not that they were happy what they had to deal with, but they knew it was time to live again and to try to find a way to build a life. Now in the new. In their new town. I think that The Last Cherry Blossom had that feeling. To me, anyway. 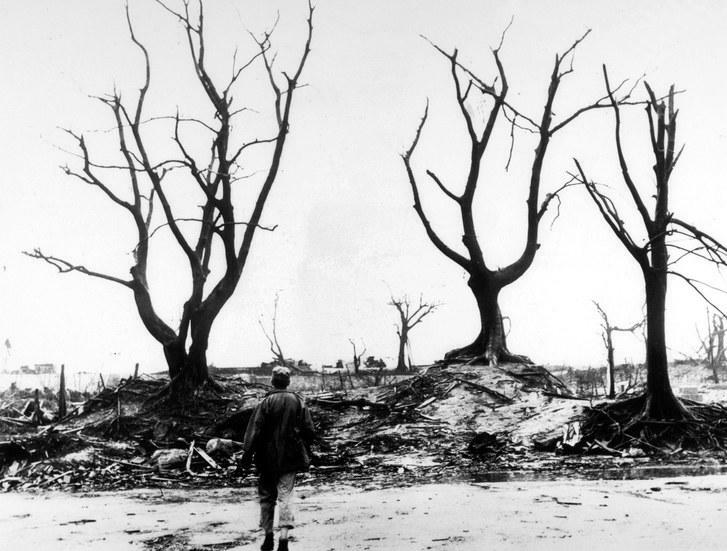 Gina: I looked at some photos of those A-bomb trees and at first I was really perplexed about it because they all lean towards where the bomb was dropped. Then I read that perhaps it was because the side that was near the explosion is where they were damaged more and so they didn't grow as much. Is that right? Kathleen: I think part of it is from the initial blast and because of the intense winds that are also caused by this type of bomb. So then a lot of trees ended up being twisted in a way that they weren't normally twisted. To see these trees is an amazing sight to behold in person. We went in 2015 to Hiroshima for the very first time to honor my mother at the Hiroshima National Peace Memorial Hall for Atomic Bomb Victims. And to see those trees and they label them. This particular tree that we have the sapling that we planted at UNCW is a ginko tree. And it's amazing to think that these trees survived the atomic bombing and then now they're collecting seeds from these trees to grow saplings and they're in over 30 countries all over the world as a sign of peace and remembrance. I was so happy that I could honor my mom and the people who suffered from the atomic bombings in the state that I live in, in North Carolina and make it the seventh state in the United States to actually have a bomb sapling planted. The reason why I chose UNCW was because my daughter is a junior at UNCW now. She's minoring in Japanese. Her major is Business. The big piece of it was that my mom only saw one school with my daughter when she was touring colleges- out of the three she went to- and it was UNCW. I just felt she got to see what it looks like and to know that the Japanese language and culture is studied at this school where her granddaughter is. I felt that that would be such a wonderful connection. Professor Kano, who is in charge of the Japanese minor in the department there, was so wonderful in wanting to help my daughter as part of the Japan club at UNCW. She suggested the fundraiser and then they just took it from there to raise funds for a plaque for the tree, for the planting, for the upkeep, planning the dedication that was on September 30th. Everything kind of fell into place and it just felt so wonderful to be able to honor her in that way. And to think it was, like I'd mentioned at the beginning, it's three generations. The three women from this Ishikawa family line being able to do this. It was very, very touching to myself, to my daughter, to my husband, to know that something like this could still be there. That what they went through mattered and then hopefully will make people think we don't want this again. We know what can happen now. We do not want this again. My book is nonpolitical. My talks are nonpolitical. But it's to get the message out there of what actually happened and why we don't want it to happen again. Gina: Did your mother know about this tree? Kathleen: No. No, it was something that I found later in 2015. I caught a little bit of it when we were visiting in Hiroshima. I think I saw a pamphlet and then when I came home I investigated it a little bit more and I was really hoping to do something around the year when the book was coming out. The book was coming out in 2016 and that's when I started investigating about it. So my mom didn't even know that anything like that existed. She never even went back to Hiroshima again after she had left there. I wish she would have been alive to see and to know about that program. She would have been amazed to know that countries have done this. And now it's nearby where she lived. The last couple of years of her life she had moved down here. Gina: Seeds, I think, are kind of magical. The fact that these life forms can come out of seeds is amazing to me. First of all, they say the tree should have been dead. Not only did they not die, but they can live on in new trees. Then bringing it in to your family- your mother could have died and then you wouldn't be here and nor would your daughter and there's just a lot of beauty in this whole thing. Kathleen: Thank you. Thank you. I really see it the same way. I feel that the seeds- they sprout hope. Even the way when everything that's set in motion, you kind of know when something is meant to be. When everything seems to start slowly falling into place and you realize we were meant to do this. You know, it took years to get to this point. And when I was sick, when it started 16 years ago and I was ill, I had a career that was totally different. I was an executive in the health care field so I negotiated contracts and did things like that, but as soon as I got sick, I couldn't continue with that any longer. So everything kind of shifted and changed. And had I not gotten sick- and this is an odd way to think of it- when I first came home from the hospital after being in for a month, I had a lot of trouble walking. I really couldn't take care of myself very well and my daughter was four. So while my husband worked during the day, my mom came. I was 31 at that point. That was when she started telling me more about her childhood, more about what happened on August 6 and sharing those memories. She entrusted me with her heart with that because she didn't tell anyone else about that. I always felt that I was helping her by letting her finally talk about it. When I look back on that now, I realize she was still being a mom helping me because she was encouraging me. She knew how tough it was for me to be dealing physically and emotionally with what I was going through at that point. But to show me that you can still push through something no matter how horrible we think we may be going through at that moment. Gina: Tell me, where on campus is the tree? Kathleen: It is right near Morton Hall where there is the parking lot for it. So the little sapling will be there and there's a plaque for it now, too. So when you walk by you can read and it'll explain what it's about. My hope is that when it gets bigger and people try to find shade, they can read the sign and know why it was planted- for peace and to remember what happened. Not for blame. My mother was always the one that said that war was hellish on both sides. But so that never happens again. That can be a wonderful reminder of how some beauty can come from the ashes of that.